Defend yourself with reliability and precision when employing OC spray from Defense Technology. The First Defense® 360 MK-3 .7% Stream allows users to aim in any direction, from any angle and still produce a solid stream of 6-8 bursts towards an imposing attacker's skin and eyes. 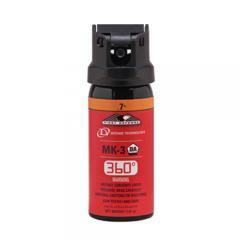 The flip-top safety activator ensures the potent spray is deployed only when intended. The stream-pattern spray is well-suited for single targets at a maximum effective range of 10-12 feet. First Defense's® signature formula is safe to use around Electronic Discharge Weapons (EDW) and is designated as non-flammable. Defense Technology manufactures their OC sprays in ISO-rated facilities and independently lab tests them to verify solution strength.